Runner-Up at the Oil City Nationals! 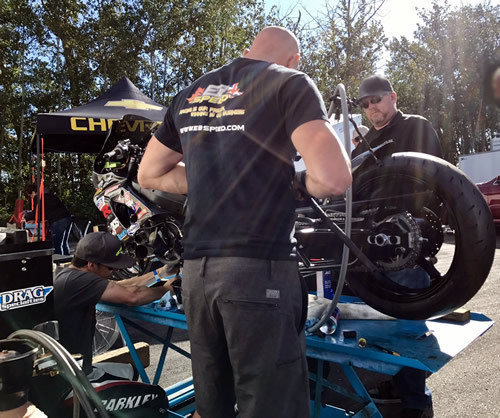 Even though it's been several weeks since the last CMDRA event, Ethan and his team were regularly testing at local tracks; making sure they were ready for the Oil City Nationals at Castrol Raceway. 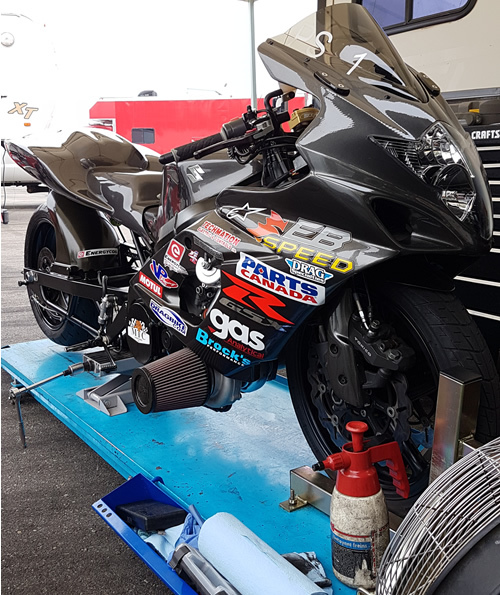 No major changes were done on Barkley's 500 HP turbocharged GSX-R1000 "Eleanor" but the new boost controller tunes were refined to be even smoother than those used at previous events. 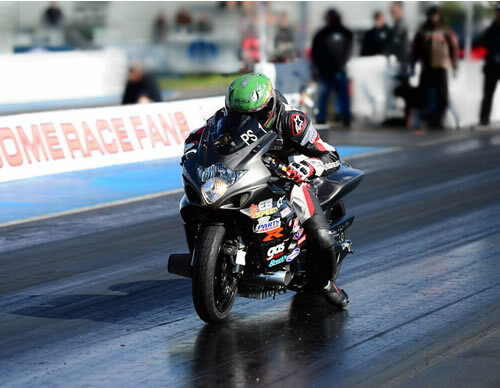 The Castrol Raceway track was in great shape and Ethan wasted little time in making good use of the grip and stunned his competitors with a 7.58 @ 187 MPH on his opening test pass. The rest of the field about a second behind as they struggled to make clean runs. Ethan opted out of the second test opportunity Saturday morning as he watched the others racers struggle to make mid 8 second runs. In the first qualifying session Ethan left the tune relatively conservative and kept things moving in the right direction with a 7.55 @ 188 MPH run. There was a hint of wheelie which forced Ethan to roll off the throttle slightly but he was still almost half of a second ahead of the nearest rival. Just prior to the second qualifying session began the clouds opened up to a light drizzle that didn't let up, forcing the postponement of qualifying to Sunday morning. After a rather dark and stormy night the teams awoke to very chilly conditions and a gusty northwest wind. This was completely different from Saturday and would take some serious tuning to get the bikes to run correctly given the sudden change. Barkley and his team worked all morning to get the tune-up for the second qualifier sorted out. Unfortunately the cool dense air allowed the motor to make just a bit too much power and Ethan had to chop the throttle. His 7.55 from Saturday would be more than enough to take the #1 spot in qualifying. In round one of eliminations Ethan had the bye and elected to see what the track could hold and turned up the boost down track. 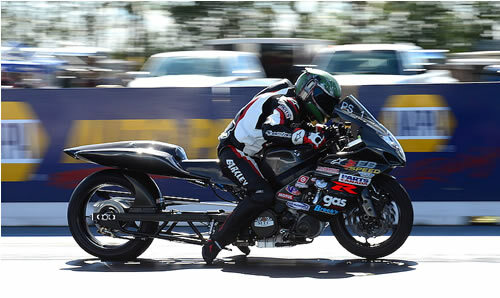 He had a clean launch and the 60' time of 1.25 was excellent the bike began to pull the front wheel higher and higher. Even with Ethan modulating the throttle as best as he could the gusty wind (which was now in excess of 40 mph) was just too much as it got under the bike as Ethan clicked into 3rd gear, forcing him to abort the run and coast through the finish line. Round two had his lined up against fellow EB Speed Rider Danny Green. Danny took the win at the pervious event as Ethan spun hard at the line. Trying his best not to make the same mistake twice Ethan softened the power delivery on "Eleanor" and decided to play it safe. As the lights flashed yellow Ethan was off like a shot while Danny had an unusually slow reaction time. It's a good thing he did because Ethan had his hands full as a main engine seal had blown out at the 300 foot mark spraying his left boot and subsequently the rear tire with oil! Not one to give up he kept hitting his shift button and narrowly beat Danny to the finish line. Amazingly Ethan kept the bike upright and still ran a 7.91 @ 175 with almost no rear grip! Before the team could think about the finals they had a major mess to clean up. It was all hands on deck as Ethan's team feverously worked to get the bike rinsed off and determine what caused the seal failure. Once the team dug into the bike, the news wasn't good, the head gasket had failed, causing a healthy dose of coolant into the CMDRA mandated overflow containment system which worked great with no coolant reaching the racing surface, however the catch can's excess pressure prevented the crankcase to relieve its regular pressure build up and pushed out the sprocket seal. So it was back to the drawing board to get the bike ready for the finals. A bunch of hose was cut and a pair of makeshift containment systems were made in very short order. Ethan knew the motor was hurt but he had to go for the win at all costs in order to have a lock on the championship. Everything was going good, the burnout was normal and the temperatures were stable at the starting line. The bike left cleanly but a few feet after the start things went from bad to worse and Ethan couldn't make up the lost power and narrowly lost with an 8.07 @ 174 to Aston's 7.80 @ 174. It was a challenging weekend considering the conditions and also the less than perfect motor for the last two passes but Ethan came away with bonus points for #1 qualifier and made it all the way to the finals on a hurt engine. With less than 12 days until the CMDRA season finals in Mission B.C., Ethan has a 43 point lead in the Championship standings. 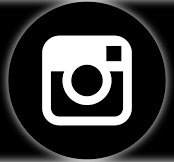 Photos by: Seven62 Media Inc.